When the time came for Mr. Farenthold to ask his questions, he demurred, saying he didn’t think the House should have even let Mr. Holder appear to testify, since he is actively being cited for contempt. 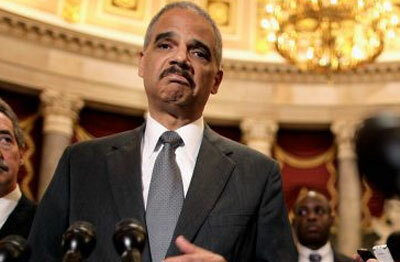 “I just don’t think it’s appropriate that Mr. Holder be here. If an American citizen had not complied with one of the Justice Department subpoenas, they would be in jail, not sitting here in front, testifying,” the congressman said. It’s unclear whether the House will take up Mr. Farenthold’s new bill, and even less likely that the Senate, controlled by Democrats, would accept it. But Mr. Farenthold hinted that Republicans could attach the paycheck denial to some of the annual spending bills. His legislation would not apply to Lois G. Lerner, a former IRS official at the center of the agency’s tea party targeting scandal, who retired from government service in September. Denying salaries for executive branch officials deemed in violation of congressional wishes is not new. For decades, Congress refused to pay salaries to officials who had been installed by recess appointments — a tool the president can use as an end-run around the Senate’s constitutional powers to confirm or reject nominees the White House sends over.